Electrical outlets are the points installed at different places in the building that transmit power to different appliances from the main supply. We generally don’t pay much heed to the types of electrical outlets that are installed in the house. However, if you are going to undertake electrical work of new construction, then we recommend that you learn about the different types of electrical outlets. Ground Fault Circuit Interrupter (GFCI) is just another name for grounded outlets. In modern electrical installations, GFCI outlets have become a basic feature of the setup. They actually consist of three sockets where two sockets (hot and neutral) take care of the current passage in regular circumstances. The role of the third socket comes into play when there is a current spike in the circuit. Without GFCI outlets, such current surges can expose the people using electrical appliances with wet hands and feet to the threat of electrocution. This is the reason why GFCI outlets are strongly recommended for kitchens, bathrooms, and outdoor spaces. Arc Fault Circuit Interrupters (AFCI) outlets are installed in the circuits to prevent electrical fires caused by arcs generated when electric charge jumps from one wire to the other within the circuit. They are usually used in older electrical networks. Some appliances need more current than the rest. So, 20A outlets are designed for all such devices. By supplying them with 20A outlets, you can ensure that the main circuit doesn’t get tripped due to high electric charge transfer. 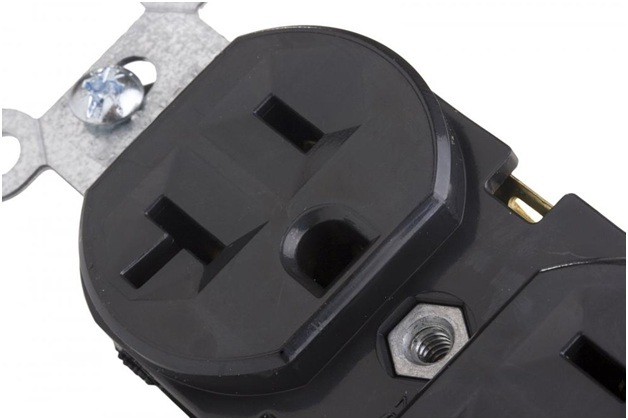 20A outlets look like any other GFCI or AFCI variant except that one of its three prongs has a perpendicular mark on it. 20A outlets can be installed in those spaces where you have to operate power-intensive appliances. For instance, a 20A outlet fitted in a laundry room for the washing machine. Switched outlets are the just the variants of GFCI outlets. Here, the power supply from the outlet is relayed through a switch. Adding a switch to the outlet is just a safety measure for preventing sparks upon connection and the waste of electricity when the connected device is not in use. Smart outlets are a part of a smart home regimen. They are integrated with receptors that can be operated through smart devices. In short, the voltage supply from a smart outlet can be controlled from any remote location through cell phones. The use of smart outlets is still very limited and can be integrated with any device. Yes, USB outlets have also made their way into the market. USB connection has become one of the top power supplying medium in the last few years. The majority of handheld appliances now come with USB compatibility. This is the reason why USB slots have become part of electrical outlets where users can directly put the USB cable into the outlet instead of using it through an adapter. These outlets can be fitted in spaces where people tend to recharge their gadgets like bedsides and alongside living room couches. RHK Electrical provides first-rate electric services through their team of seasoned electricians in Magnolia and adjoining areas. Their experts can help you in picking the right outlet for every area in the house.